1970 Dennis F46 (EWU 755H) Water Tender Ladder whilst on the run at Sowerby Fire Station,North Yorkshire back in the early 1970's.Having seen that brilliant picture (4437) I thought you might like to see how they looked during the better years of their lives.....the 1970s. Great picture Pete, Will take a copy to my workshop, it will inspire me on the days when nothing goes right! Added by Stewart Kaye on 17 November 2007. Something which is slightly unusual on this Dennis is that the spot and fog lights are upside down. Normally they were always mounted under the bumper which was pre-drilled at the factory. Was this upside down configuration standard, or did the North Yorkshire workshops make a mistake one day and fit it upside down? Added by Barry on 17 November 2007. Stew, its a great pleasure to see these old vehicles being restored by people like yourself, and to see your old 1970's Dennis F46 back in its restored condition will be brilliant.I look forward to seeing it when finished, and maybe even at the Odiham Fire Show in Hampshire in years to come.We dont see any white machines (appliances) around these days, so I look forward to seeing it.......Pete M.
Added by Pete Matten on 17 November 2007. Added by Lou Cowan on 17 November 2007. Hi Barry, All of the pictures of West Riding F46s i have seen, all have the lights above the bumper, but i don't know why. Added by Stewart Kaye on 18 November 2007. Great picture, but can I point out the appliance is a WEST Yorkshire machine, Sowerby also being from that brigade. Added by Andy Daley on 18 November 2007. Thanks Barry for answering the one question regarding the spot lights above bumper, I couldn't answer that.Thanks also Andy for pointing out its an old appliance from West Yorkshire, not North Yorkshire, my eyes are not as good as they were a few years ago.Lou, good to hear from you again, the two big hinged things I think your on about are tow bars.I cant though ever remember towing anything in my days in the brigade with them.Regarding your other question, when did Dennis stop making Pump Escapes?I'll get intouch with JDC to try and find out, hopefully get back to you soon unless someone else knows the answer.Pete M.
Added by Pete Matten on 18 November 2007. Added by Lou Cowan on 18 November 2007. Well done Lou, I'm a little slow on the up-take these days...'very funny'I should have realised what you meant.The old brain, like the eyes are not what they used to be anymore.Pete M.
Added by Pete Matten on 19 November 2007. Two Australians with an English sense of humour!! (Pavel being the other). We are lucky! Added by Barry on 19 November 2007.
my E.Mail.Well I don't give in that easy, and I have sorted it out myself.I've actually found a picture I took in 2006, got the info now so watch this WEBSITE for a little history.You'll be surprised.Pete M.
Added by Pete Matten on 28 November 2007. Pete, I think your last comment may be confusing. At the time the last pump escape was built the factory was at the old magnificent Woodbridge works and the company was 'Hestair Dennis' not Dennis Brothers. When they moved to the new Slyfield Industrial factory the company was reformed as Dennis Specialist vehicles. At this point they decided to concentrate on chassis cab production only. John Dennis (the grandson of one of the founding Dennis brothers) decided to continue the body building tradition as a separate entity on the same Slyfield estate as JDC. The current company Alexander-Dennis is the true direct descendent from the founding Dennis Brothers company. Added by Barry on 01 December 2007. Thanks Barry for putting a few important facts straight, I appreciate it.Pete M.
Added by Pete Whiteley on 06 December 2007. Hi Pete, my mate and i are trying to trace the whereabouts of the survivors of this batch of 35. We have done various searches, and it is beginning to look like only two have survived. One of them is CWT 759H which is painted red and owned by Lancashire fire brigade, the other being my appliance CWT 762H. If anyone out there knows differently, i would be delighted to hear from them. Added by Stewart Kaye on 06 December 2007. Interesting project that you have going on there. I remember as a kid living near Rawdon fire station (Leeds)an identical (or very similar) machine stationed there throughout 1970's and possibly the earlier part of the 1980's. Certainly a white Dennis. There was also a read cabbed Bedford of some antiquity for the retained crew, and, I just remember (before the Dennis) some machine with ladders with very large wheels fitted at the back. Interestingly for you on here that are professional in the UK brigades, I have lived in Düsseldorf for a number of years - standard turn out for a shout in a building of more than two floors is 1 pump, 1 rescue pump, 1 turntable ladder, plus paramedic unit within 5 mins if possible, certaily within 7 mins from call going in! Added by Tim Mellors on 19 December 2007. Ref:-ex west riding dennis f46 spot and fog lamps.they were fitted this way because the exhaust silencer was mounted transversely behind the bumper and vented on the o/s under the drivers step.the "two big hinge things" at the rear were to lower or lift the head of the lacon 45ft ladder when removing or replacing the ladder on the appliance . Added by Carl Kavanagh on 19 April 2008. Like Pete (Whiteley) I was also stationed at the now closed Sowerby Bridge station. EWU 755H was the first fire engine I ever drove, (apart from the driving school ones for my HGV test) Again fond memories, especially of the driving position with the steering wheel being in front and to the right of the driver, and of course the crash gear box which just added to the mystique of driving it. Biggest laugh was to let the engine over-run down a hill, then blip the throttle at the bottom. The bang and sheet of flame from the exhaust was spectacular, and made many a poor pedestrian have near heart failure! Added by Wayne Ogden on 21 May 2008. I joined the West Riding County Fire Service in 1972 and was posted to Castleford Station, which was also the Divisional Headquarters for Pontefract Division. The fist line appliance at the time was a white Dennis F46 Water Ladder registration number BWY616H. It had not been painted white, the white was a dye put into the fibreglass body work during construction. 35 were delivered by Dennis Motors to replace the Pump Escape appliances, literally in one sweep. There were 2 versions, one with drum brakes all round, the other with disc brakes all round like the one at Castleford, identical externally except for the front bumper. The front bumper on the disc brake version, for some reason, had a wider gap from the front bodywork than the drum braked one. If you stood at right angles to the appliance near to the front, the bumper on the disc brake version was directly in line with the nose of the bodywork just below below the windscreen, the drum brake version was more inset making the nose of the bodywork stand out from the bumper. I know that on occasion, particularly with workshop staff who were used to driving both versions on a weekly basis, they could be caught out thinking that the bumper bar was the most forward part of the vehicle when close-up parking. A feature with the vehicle was the rear-ward facing seats in the crew cab, at the time it was conceived as being a safety feature, so it was but it did not suit everyone to be travelling backwards especially when driving to incidents. The dics braked version did not like stopping, in those days it was unusual to have disc brakes all round on a heavy commercial vehicle, they were still in their infancy at that time and until you got used to their capabilities you could easily be caught out. To be fair the performance of the 6, 522cc straight 8 Rolls Royce petrol engine also made the brakes work hard. The F46 was made to go, stopping was something else, if over-revved they quite easily bent engine push rods. They would easily do 90mph on the flat on a clear road, unfortunately they were rather thirsty machines, ours averaged something like 4-6mpg, luckily we had a petrol pump at Castleford. On one famous occasion during a fire call, the battery on the F46 did not have enough life in it to start the engine, out with the starting handle and after just a very short turn the 8 cylinders burst into life. When other appliances were beginning to replace them some years later quite often we would be given a drum braked version as a spare when the Water Ladder was 'off the run'and apart from the distance of the bumper from the bodywork I noticed that this version also had a smaller gearlever knob fitted for some reason. I was told by an older fireman that when the F46's were being allocated to stations who were to receive them on a permanent basis, the one at Castleford that was sent for driver training purposes developed a cylinder head fault that caused it to overheat and it had to towed into the brigade workshops at Birkenshaw for repair. The fault was reported to Dennis Motors whereby they sent a tow truck at 5am one morning during darkness after removing the "Powered by Rolls Royce" badge so that it would not be noticed by members of the public. I often wondered if one had survived, it seems that there may be two members that have. I hope you will find this information of some interest! Added by Gerry Firth on 05 September 2008. Hi Gerry, I for one love to hear stories of older appliances when they were on the run. You would be surprised at the inspiration it gives you when you are laid in a puddle underneath one, with bits of it falling in your eyes, and no skin left on your knuckles, all in the name of preservation! Please keep these memories coming in. Added by Stewart Kaye on 05 September 2008. Great bit of info Gerry, I only drove one when we had it as a spare. Not sure which model it was, it was in the late 70's, we had a few which "came over the Border" to North Yorks with local boundary change. I remember they went like mad but didn't want to stop as you say in you comments. Thank you. Added by Paul Warnock on 05 September 2008. Does anyone know where I can get hold of a 1970s Fire Brigade Fire Extinguisher Box? Added by Don on 06 February 2009. Whilst serving at Rawdon, my favourite trick to wind the sub. O. up was to hurtle over the bridge at apperley Bridge at great speeds causing the engine cowl to lift & the sub having to sit on it to keep it from flying off!! Added by Martyn Johnson on 27 February 2010. I served at Elland FS. The Sowerby Bridge F46 had its cable damaged at the round about in Elland in about 1978. The fibre glass was damaged beyond repair, and a replacement was obtained from Northern Ireland, and had to be painted white. We were told the reason for these being white was a Home Office trial to increase visibility. Sometimes attend incidents on the M62 the OiC had to sit on the engine cowelling to keep it in place. The F446 was a firefighter appliance, the Elland Wrl was was BWX 689H I think? Added by Geoff on 05 June 2010. Added by Martin on 30 August 2010. A lot has been written within these columns regarding these Dennis F.46 WrLs of the former West Riding County Council Fire Brigade I recall the first batch leaving from Dennis Brothers Woodbridge Works in 1969 it was publised in the Fire Journal Magazine of that year. The colour experimentation commenced with four/six Home Office Emergency Pumps (Green Goddesses) these were purchased by the Brigade and underwent modernisation before being placed on Divisions as Brigade reserves. 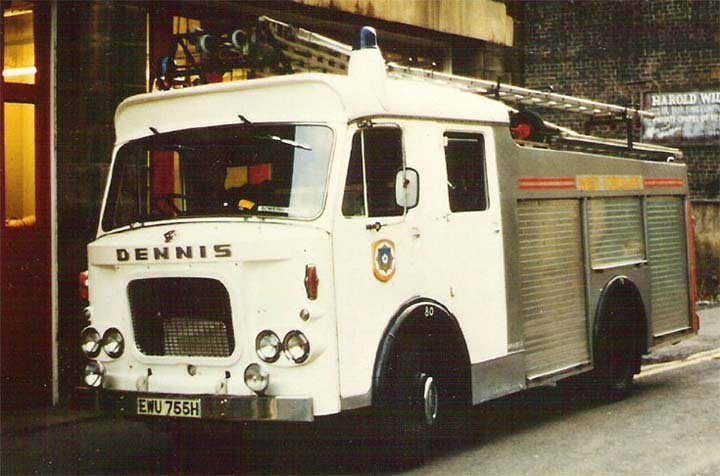 Of the first batch of Dennis's that arrived within the Brigade was a Dennis F.45/Simon SS55ft Hydraulic Platform/Pump, can anyone tell me what became of this handsome appliance I, saw it at Dennis undergoing acceptance trials pre-delivery and with the brillant white booms it really looked the part I, have found some photos of this handsome pump being tested, where was it based or like so many other appliances was it was moved around but most importantly did it survive? perhaps into the hands of a private contractor for street lighting etc or is it laying in a farm yard somewhere it had the registration number DWY 745H. can anyone out there inform me? Added by BOB CARVER on 15 November 2010. Does anyone know or have pictures related to the crew that worked early 70s my grandad was the fire chief "jack Garforth"
Added by Martin on 21 February 2014. Added by Wayne Ogden on 22 March 2014. Hi all, stumbled upon this site whilst looking for old photos of my grandad, Dennis Keys, who served at castleford Fore Station for many years. Added by Lisa Ward on 15 November 2015. I remember as a kid Elland had one with a Land rover too . Added by Marcel on 13 December 2015. There was a water ladder, water carrier and ET at Elland all in the white livery. Added by Geoff on 15 December 2015. Added by Marcel on 17 December 2015. Added by Howie knowles on 02 May 2016. I have loved reading these with my father. Who has great memories of this exact pump. David Askew is my dads name and drove this many times, he knows a couple of you commenters too. Added by Scott askew on 18 June 2016. Sowerby Bridge Fire & Water has a lease on the Hollins Mill Lane block which includes the fire station. We plan to convert the whole block into a major community facility for the residents of Sowerby Bridge and we are already using the main space in the fire station for events although the larger project will take some years to complete. We would like to collect memories about the fire station, and photos, so that we can put on an exhibition there so if anyone would like to contact us about this you would be most welcome. email phil.hawdon@hawdonrussell.co.uk or phone 01422 834291. Added by Phil Hawdon on 17 October 2018.